Over the past couple decades, a new vitality has re-entered the study of history. More and more people are reading history for leisure, attending historically themed events, and participating in ‘living history’ groups and historical reenactments. Somewhere between the professional archeologists and lay historians are those individuals who, while not necessarily holding postgraduate degrees and the like, nonetheless attempt to authentically replicate aspects of the past through experimentation, using authentic resources, materials, and methods. Jamie Hall, the creator and author of Primitive Method, is one such person. 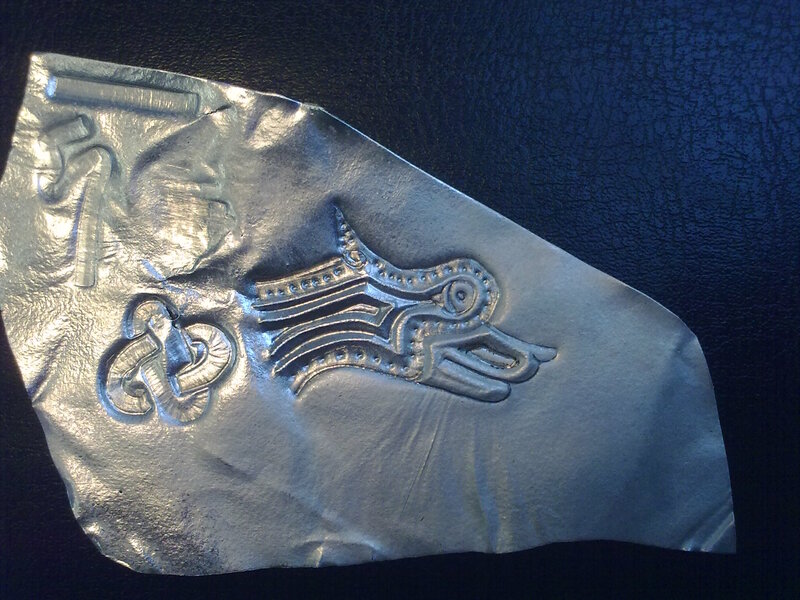 For the past year Jamie, who works in the jewelry trade at his father’s shop in Derby, has been publishing posts about his research into and practise of the techniques of medieval jewelry making. 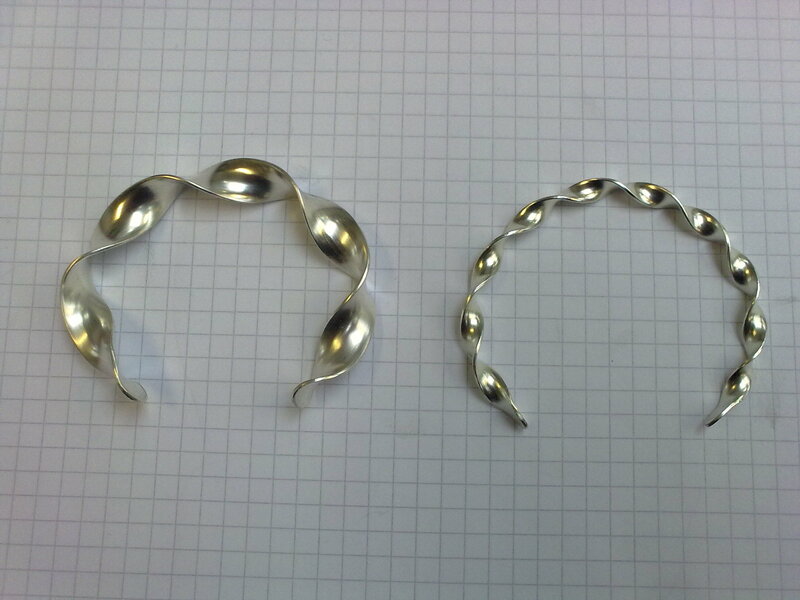 The chased interlace bangle (above), the anticlastic bangle (below left) and Celtic twist bangles (below right) are just four items produced by Jamie using the “old ways”. Quite graciously, Jamie agreed to be interviewed to discuss his Primitive Method project, how the project has changed him as a jeweler, and the reality of medieval jewelery making past and present. And so without further ado, let’s get to the interview. Could you first let the readers know about your background in the modern practice of jewelry making? 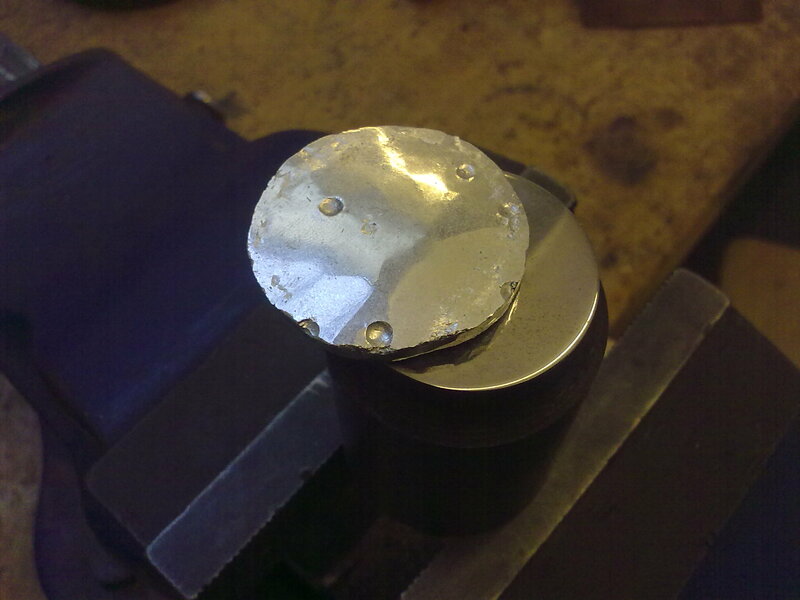 A little under 6 years ago, I was offered a job by my father, who is a self-taught manufacturing jeweller in Derby. Initially, I worked in the shop, but I gradually began to do the final polishing of items – a dirty and time-consuming job – and I slowly began to do more and more work. I’ve always joked that I did a medieval apprenticeship, rather than a Modern Apprenticeship (a UK vocational training program), because I spent a lot of time cleaning out the machines and making cups of tea. 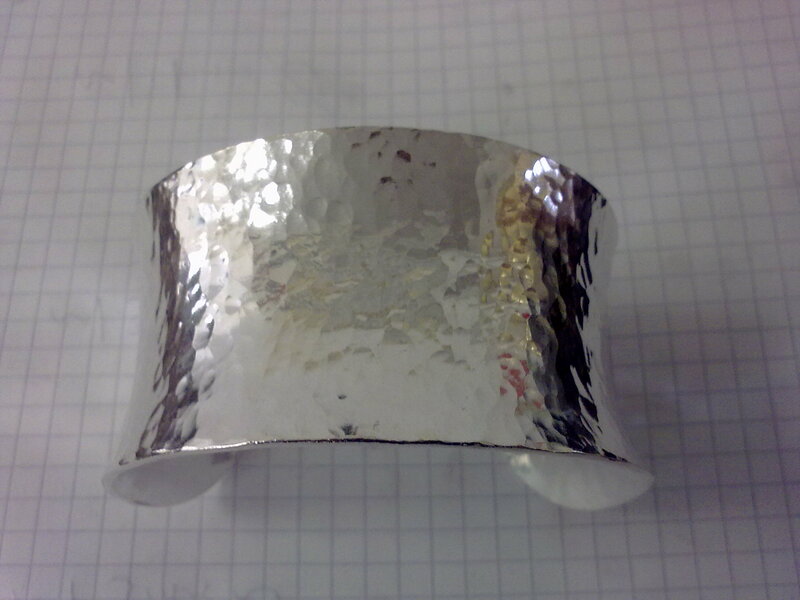 Synclastic Bangle: a long sheet of silver can be made into a synclastic bangle. The ends are rounded to make it comfortable to take on and off. How did you first get the idea to study the old techniques of medieval jewelers? What did you initially hope to achieve or learn? Have your goals changed over the course of the project? Have you met any of your goals along the way? 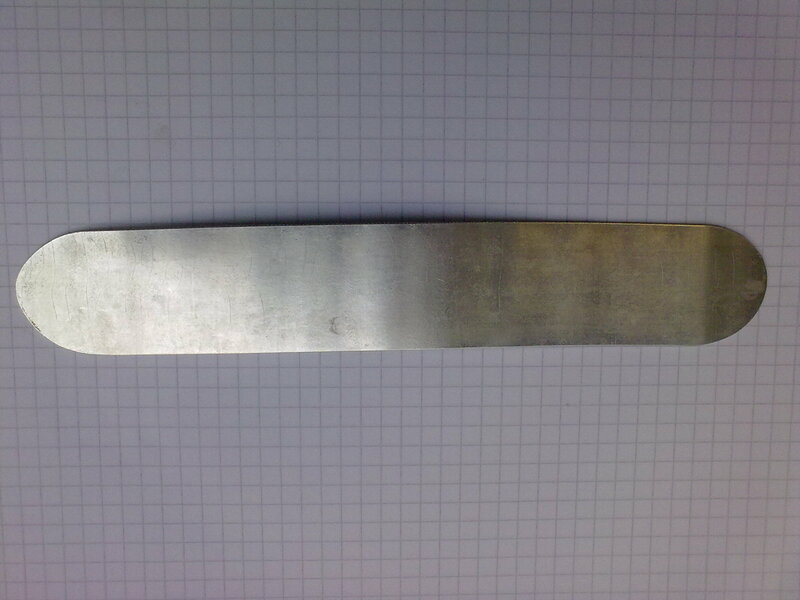 A saddle shaped groove is used to put a curve into the long axis of the sheet. From what you have learned so far, in what ways does medieval jewelry making differ from modern practices? Have any old techniques of merit been lost to modern jewelers? 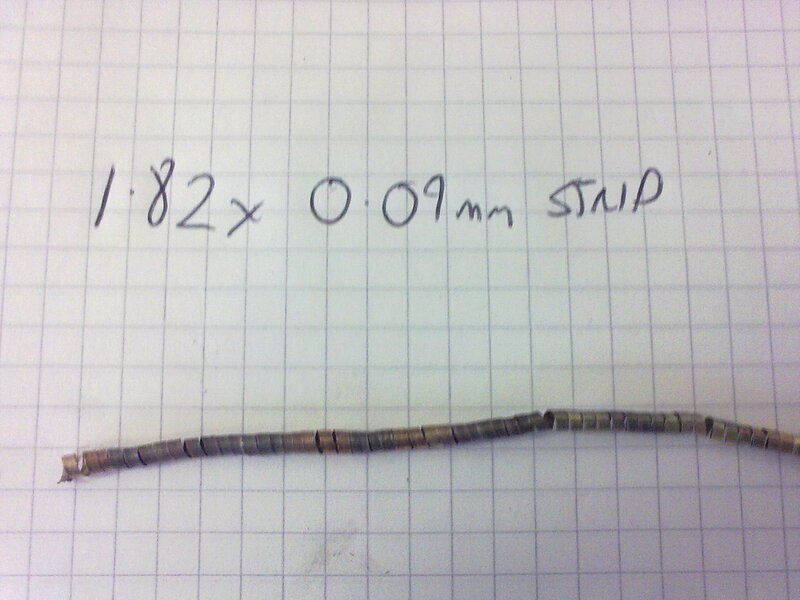 A round stake is used to shape the sheet into the basic form of the bangle. You stated in your blog that the reason you do your research is to improve your work as a jeweler. Have you found that your work has indeed improved? If so, in what ways? 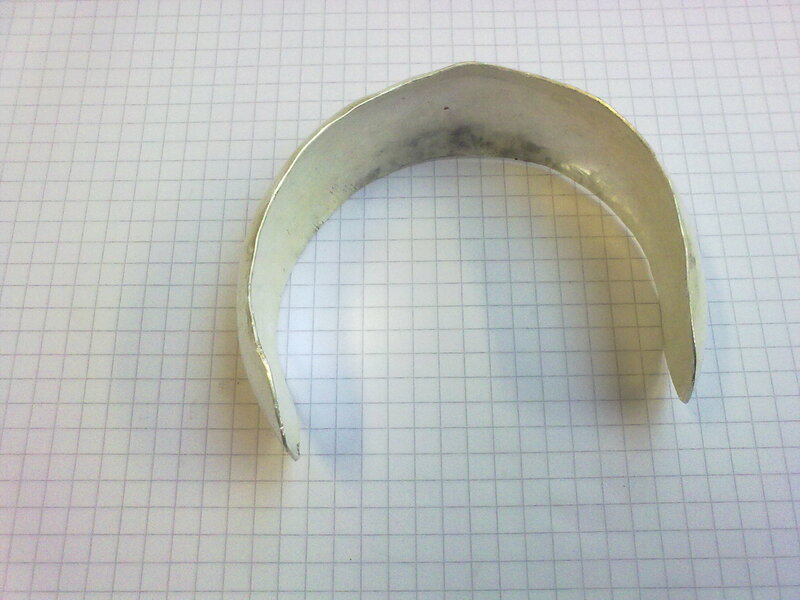 The bangle immediately after being shaped at the round stake. You also said in your blog that, “understanding older methods should really form the backbone of our training as metalsmiths – we need a basis from which to innovate, instead of blindly following processes we don’t understand.” Now that a year has passed since you started your research, do you still feel that understanding the older methods should be part of the training of a modern jeweler? 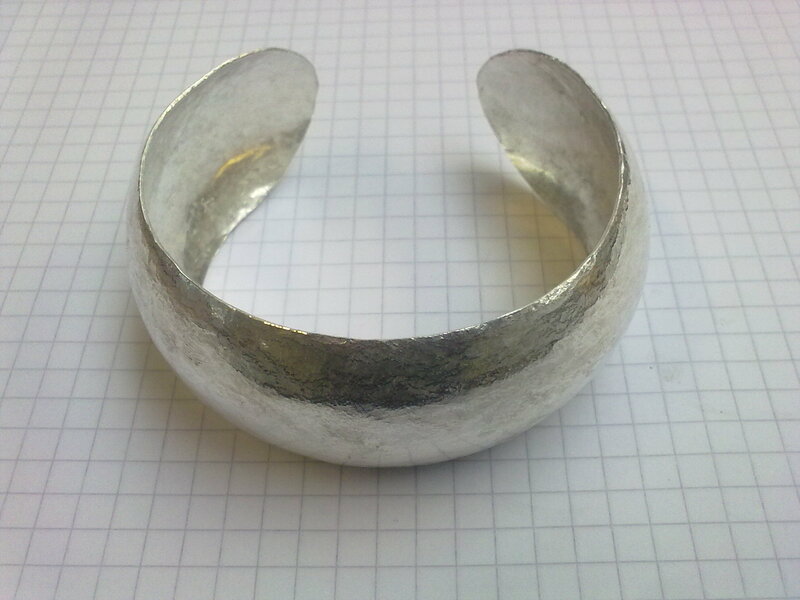 The edges of the bangle as gently and evenly hit with a hammer - this trues up the whole piece, and to some extent it hides any asymmetry. It's then rubbed with charcoal, followed by a burnisher. This is more bronze age than medieval, but it's important to master these basic forms before attempting more complicated work. The other area that would really benefit is jewellery repair. This is a major component of my work as a modern jeweller, and the ancient skills provide you with a greater understanding of the structural and visual restoration of an item, and this is something that graduates are sorely lacking, in my opinion. It’s such a financially rewarding part of the job, and there’s plenty of repair work out there that needs doing – obviously, it lacks the glamour of art jewellery and bespoke work, but it does pay the bills. I’m currently insanely busy. On the strength of the blog, I got an arts residency at Loughborough University School of the Arts, on a programme called AA2A. I’ve had full access to their metalworking rooms, which include a fantastic collection of anvils and stakes (used for shaping sheet metal), and a wide selection of hammers and other hand tools. Plus they’ve got a blacksmithing hearth, so there’s plenty of scope for toolmaking. There’s a work-in-progress exhibition in March for that. I haven’t been posting on the blog quite as much in the last few months, but it’s because I’ve been doing a lot more, and researching a lot less. When I get a quiet period, I’ll hopefully write up what I’ve been doing at Loughborough. I’ve got several things coming up this year. I’ll be writing for Benchpeg.com, which is an online jewellery newsletter for the UK trade, and I’ve got several applications to make for bursaries and residencies. I’ll also have to start looking into exhibiting more of my work. Everything seems to be going well at the moment, but I worry sometimes that I’m in a funny place, professionally – the project is too practical to be archaeology or fine art history, but too educational to be art in the normal sense of the word – finished works are less important to me than the process required to make them, but I clearly need people to see me as an artist, so I’ll be making an effort with public relations – hopefully giving lectures, and doing more interviews like this one. What are your long-term goals as a jeweler? Do you believe your work in learning the old techniques will be of any substantial benefit in achieving those goals? There are a few avenues open to me. I expect to carry on with the Primitive Method in one form or another for the forseeable future, ideally making commissions and selling through exhibitions, but there is also the family business, and my family must obviously come first. I’ll always be at the mercy of money, which is sort of ironic, because without money, society wouldn’t provide me with any customers for this kind of specialised work. This summer, I’m hoping to convert an outbuilding at home into a primitive forge. It was my plan for last summer, but time got away from me. There’s a limit to what I can do at home – sustained hammering wouldn’t be fair on the neighbours, but there are lots of things that I’d like to do, like casting silver using a charcoal hearth. I’ve also been talking to some reenactors; I’m intending to do some Living History demonstrations at some point this year. Do you think it would be possible to financially support oneself as a jeweler if one used only the old techniques? For example, would the extra time involved in creating each piece make the ultimate price of any particular item prohibitively expensive for customers? I think that there is a tiny, tiny percentage of the world population that is willing to pay well for fine craftsmanship. If I’m very lucky, I’ll be able to sell my work to those people, and further fund the Primitive Method, but the truth is that most customers can’t afford to pay me to spend 10 hours hammering when I could buy silver sheet out of a catalogue. But I don’t have to use all the skills all the time. It will make sense to sell several grades of work – some of it as perfect historical reproductions, some of it as completely modern work, and lots of things that fall inbetween, with contemporary design, but mostly using traditional skills. 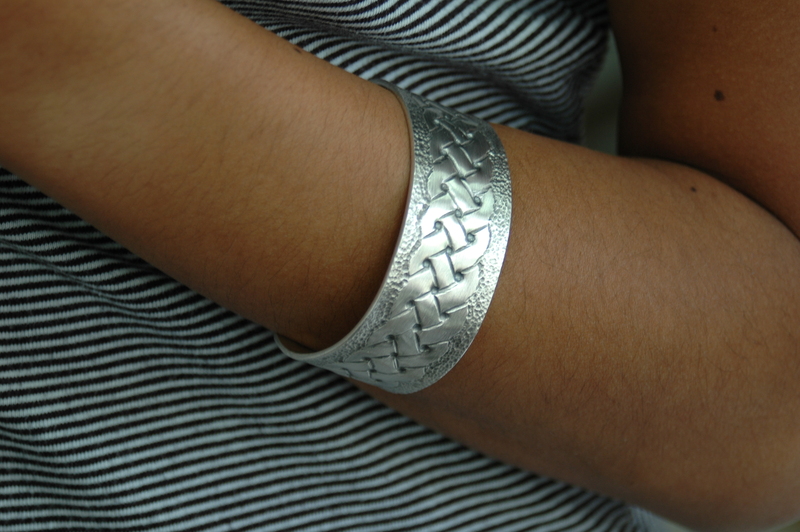 Style is an important issue here – medieval styles attract many people visually, but not everyone wants to wear them – it will be necessary to keep skills alive by using them to make jewellery that’s more appealling to the modern eye. Is there anything else you would like to mention or tell readers? If you can cope with books from a latter period, Cellin’s ‘Treatise on Goldsmithing and Sculpture‘ is a good Italian text from the Renaissance, as is ‘De la Pirotechnia‘ by Biringuccio, which provide a wealth of technical descriptions of metallurgy and metalworking. I’m always on the lookout for interesting books, so I’d welcome any recommendations that people can send me. 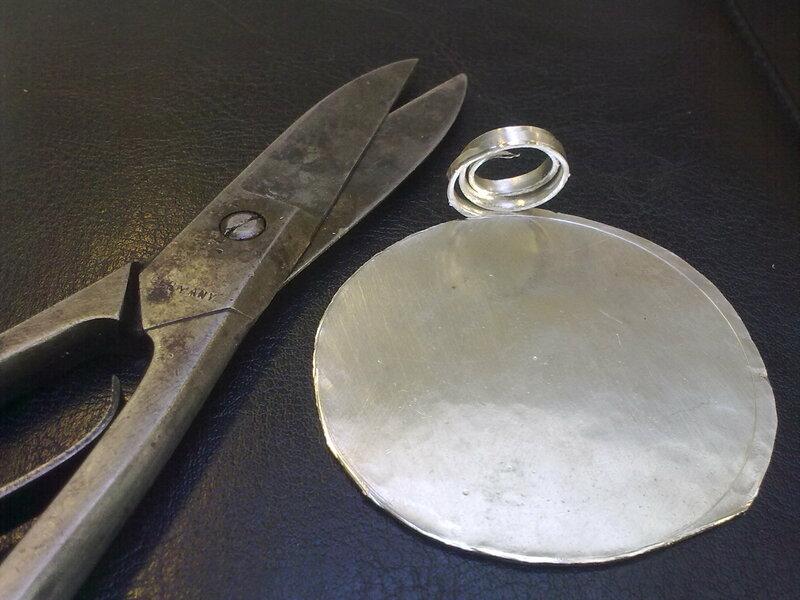 And now here is a step-by-step guide by Jamie on how to turn a cast circular ingot of fine silver into decorated fine silver foil. 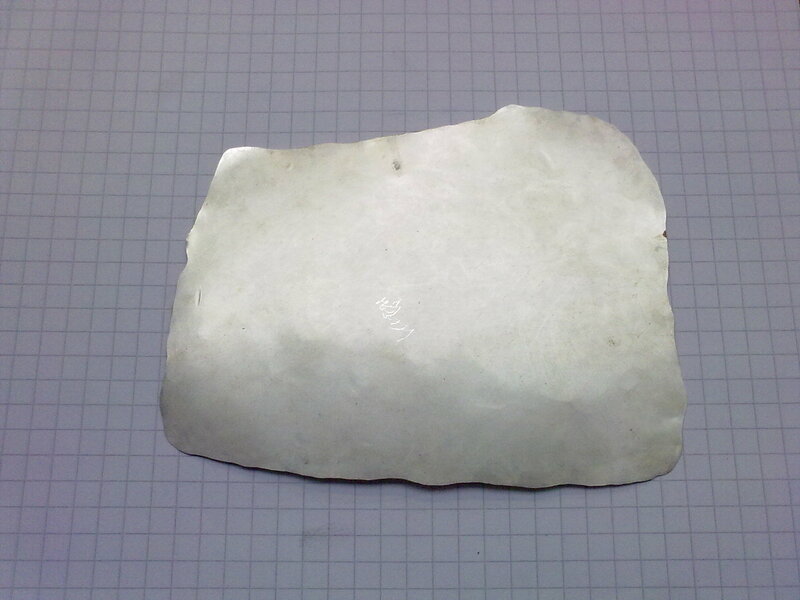 A cast circular ingot of fine silver is cleaned up by filing and scraping any cavities away. A domed punch is used to open out any large cavities (those are the round holes). Ideally, the work should be cleaned with lye (caustic soda) and water and then put in acid for a while. Before the advent of strong, fast acids like sulphuric acid, you could have used citrus juice (lime is best) or vinegar, and left it for a few days instead of a few hours. 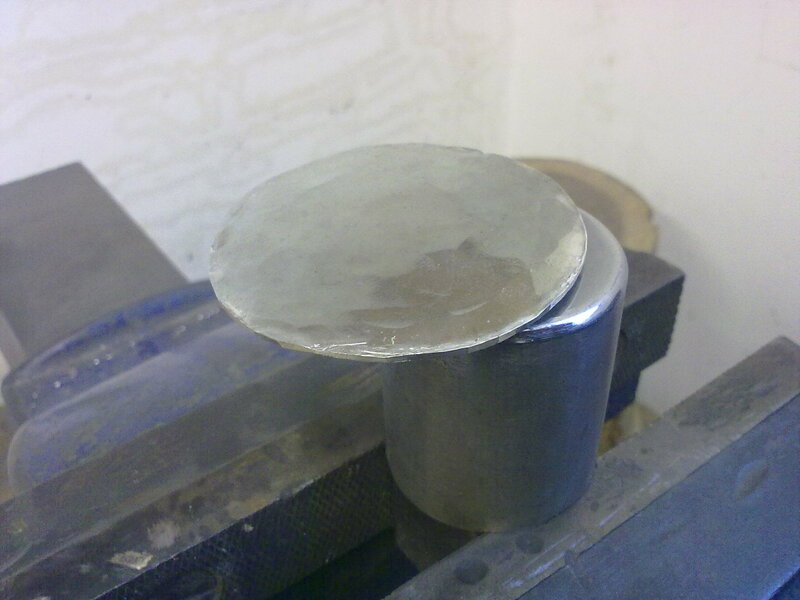 The ingot is hammered, taking 2 or 3 hours. The holes disappear, and the main focus is on keeping it as round as possible. 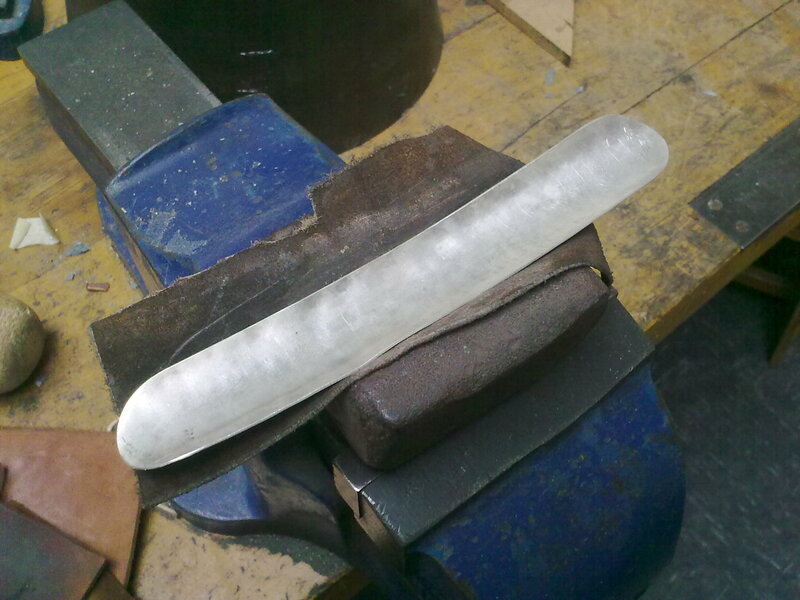 You can see that the ingot starts out about the same size as the steel stake, and gets larger as it gets thinner. 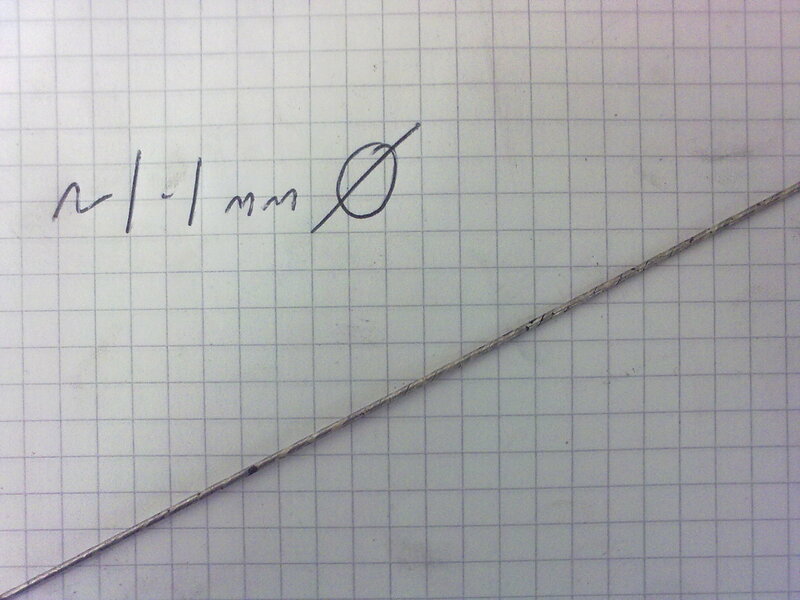 At about 1.1mm, dividers are used to mark out a circle, and shears are used to cut it. This is surprisingly easy to do, and only requires a little filing afterwards to give a neat circle. 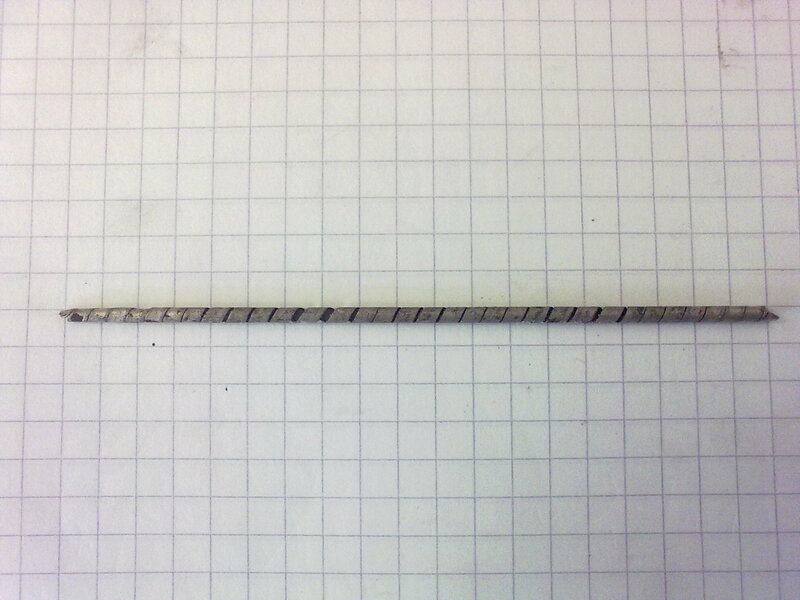 A modern jeweller would generally use a piercing saw to do this. 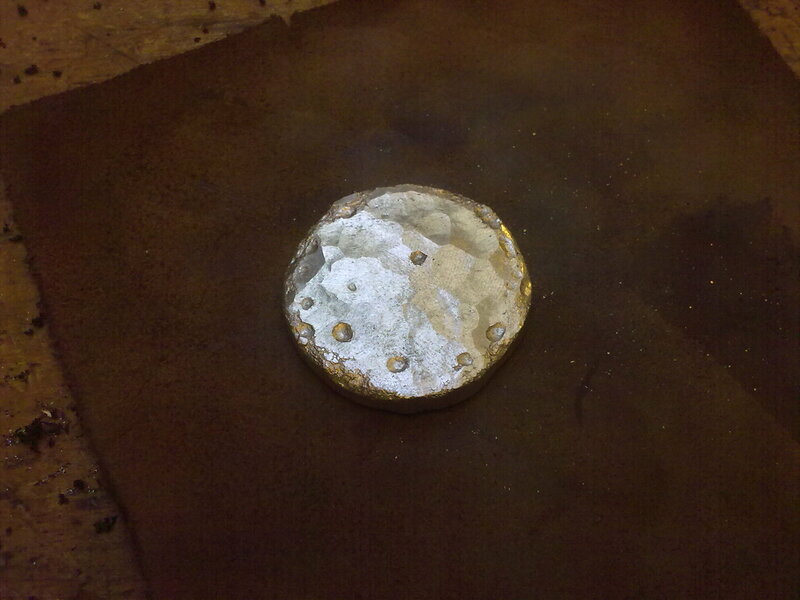 A piece like this could be used to make a disc brooch, or raised to make a small bowl or chalice. 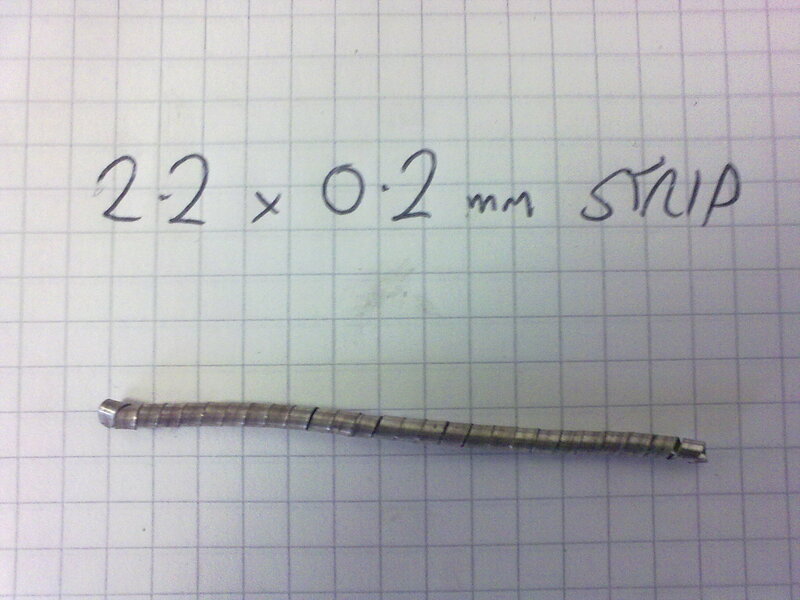 Instead of stopping around 1mm, you can keep on going, and make the sheet thinner and thinner, eventually turning it into foil. 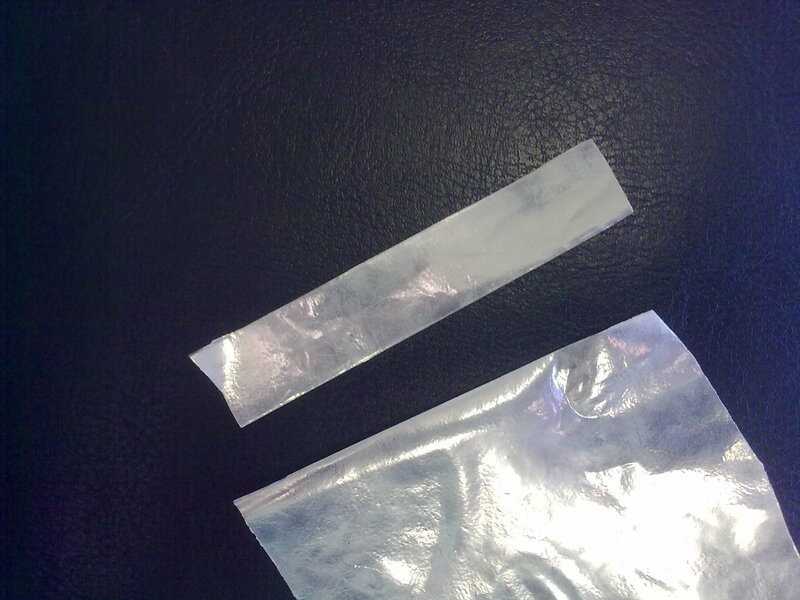 STEP 5 This is about 0.2mm thick, which is the point at which you’d stop calling it sheet, and start calling it foil. 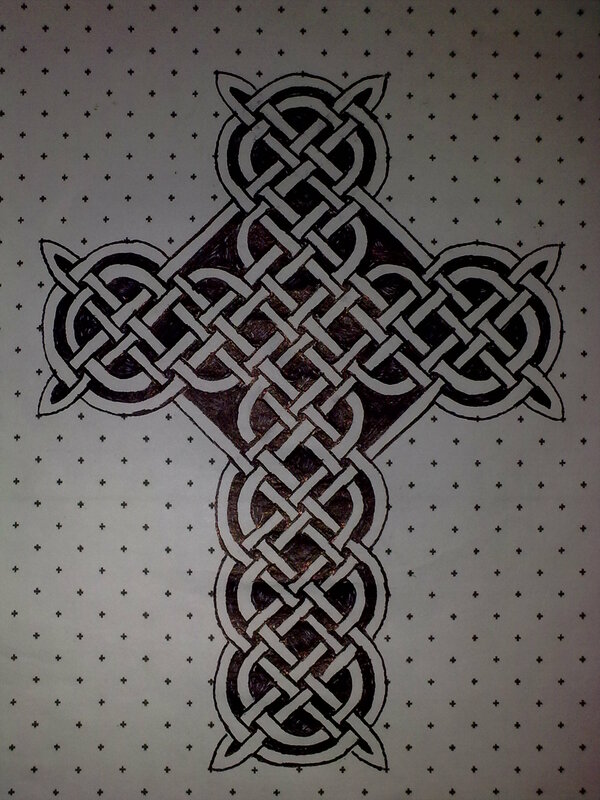 If you want to apply a pattern, this is still a bit thick. 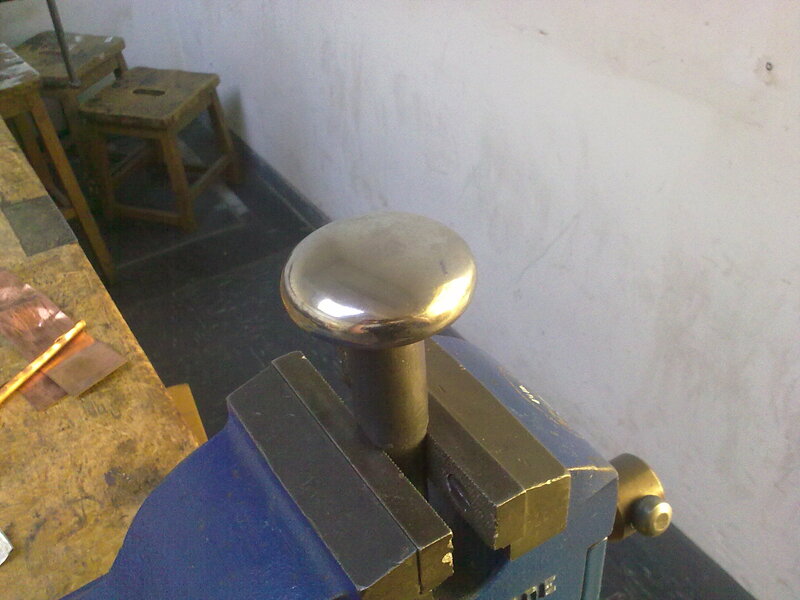 The shiny surface comes from using a well polished hammer. This is about 0.05mm thick – that’s 1/20th of a millimetre – and a burnisher and/or charcoal is used to brighten the surface of the silver. 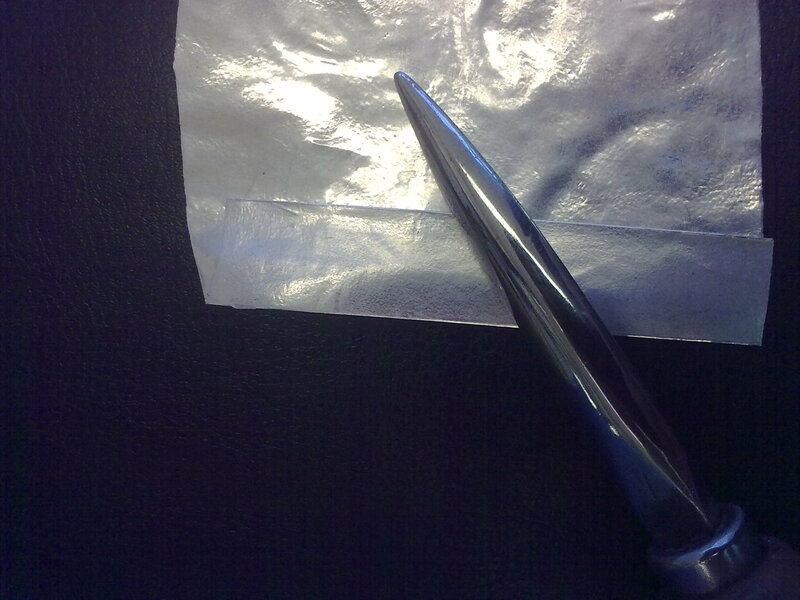 By folding the foil it’s possible to stiffen the material (which is very delicate), or the burnisher (pictured) can be rubbed on the fold to remove a section – it’s too thin to separate with shears. 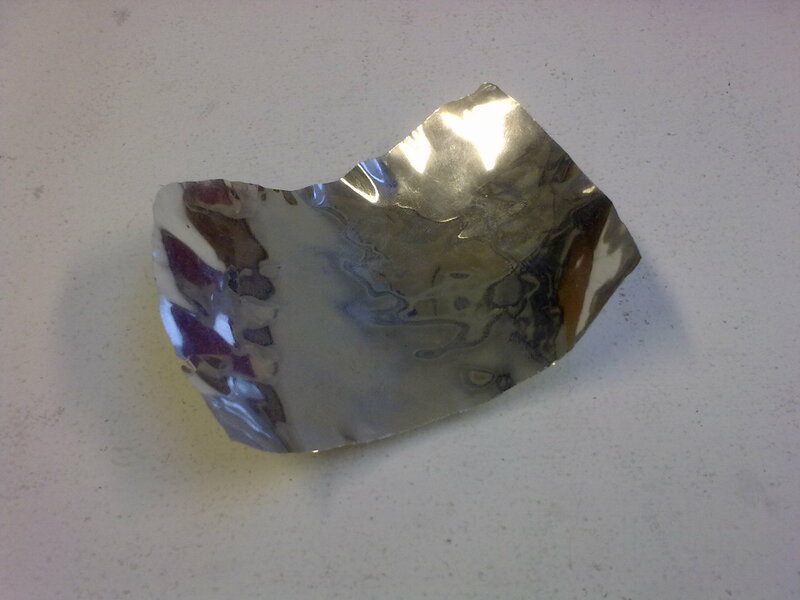 A dog’s head rubbed into the foil with a blunt spike, alternating between the front and back to give height and depth to the surface of the foil. This entry was posted in Cræft (Art), Gemōt (Meetings, Interviews) and tagged jamie hall, jewellery, jewelry, primitive method. Bookmark the permalink. This jewelry is amazing, but can I buy any?